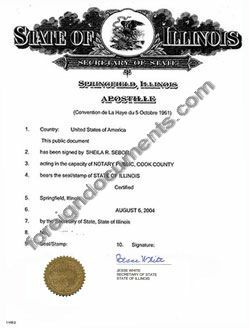 Certified copies of Birth Certificates, and Death Certificates certified by the County Clerk, Local Registrar, or State of Illinois Department of Public Health. Certified copies of Marriage Certificates certified by the County Clerk or State of Illinois Department of Public Health. Certified copies of Divorce Records certified by the Circuit Clerk.